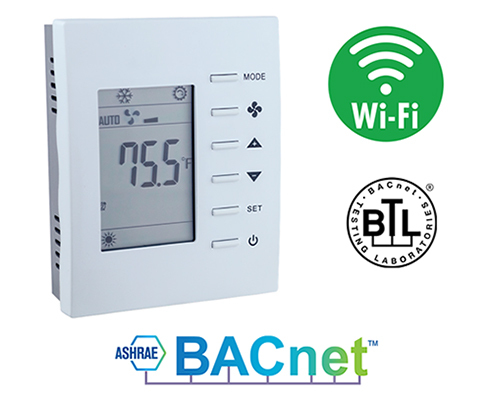 The BASstat series of BACnet-compliant wired or wireless communicating thermostats are BTL listed to ensure effortless integration into BACnet/IP (Wi-Fi) or BACnet MS/TP (EIA-485) networks. These thermostats are suited for single or multi-stage heating, cooling and ventilation binary output control applications such as RTU or AHU. Configurable control algorithm parameters allow adaptability to the specific application. Adaptive control algorithm applied to multi-stage on/off control saves energy and ensures seamless comfort for the occupants. Built in temperature sensor, input for remote temperature sensor, or temperature override network command from Building Automation System. Occupancy status can be set from thermostat buttons or over the BACnet network. Thermostat buttons are optionally lockable to prevent unauthorized control. Digital display with graphical icons is easy to read and understand. The BASstat's white backlit LCD display is large and easy to read, even from a distance. It incorporates graphical icons to aid visual indication of current state of operation. Several icons indicate parameters such as: Active Mode, Cooling stage 1 or 2, Heating stage 1 or 2, Ventilation Only, Fan Active, Occupied/Unoccupied state, and Clock icon to indicate Short Cycle Delay or Max Cycles per hour active waiting state. These icons are very useful in indicating the thermostat's current state of operation.